Zachary D. Schultz earned his B.S. in Chemistry from the Ohio State University in 2000 and Ph.D. in Chemistry from the University of Illinois at Urbana-Champaign in 2005. He performed his doctoral studies under the supervision of Prof. Andrew Gewirth using infrared-visible sum frequency generation spectroscopy to characterize electrochemical interfaces. Prof. Schultz was a National Research Council Postdoctoral Fellow at the National Institute of Standards and Technology (USA). His research at NIST was performed largely in collaboration with Ira Levin at the National Institutes of Health (USA). 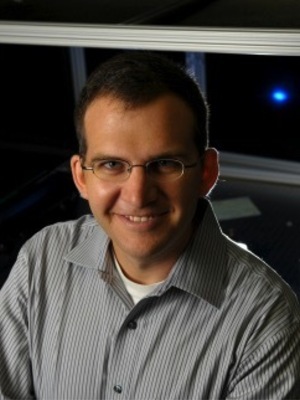 Following his postdoctoral training at NIST, Dr. Schultz continued as a research fellow with Dr. Levin at NIH using vibrational spectroscopy and microscopy to study biomembrane systems. Prof. Schultz began his independent career as an assistant professor of chemistry and biochemistry at the University of Notre Dame in 2009, and was promoted with tenure to associate professor in 2015. In January of 2018, Prof. Schultz moved his research program to Ohio State. In the Schultz Lab, we believe the new scientific breakthroughs will be enabled by state of the art chemical measurement. Our research focuses on developing new tools for identifying molecules relevant to biomedical diagnostics and other applications. To do this, we build and develop instrumentation that takes advantage of chemical properties to characterize complex samples. The interaction between lasers and molecules provides unique information for detecting and identifying the components in complex systems. Understanding the basic science involved in chemical detection and manipulating these interactions has led to breakthrough technologies with tremendous potential. We are actively pursuing problems in metabolomics, protein receptor signaling, and active plasmonics. The ability to specifically identify and quantify the 40,000+ metabolites in the human body is essential for a systems biology approach to health care. Changes in biochemical pathways can be distinguished provided enough intermediate molecules can be monitored accurately. Current technologies can identify about 20% of the in biological samples. Our lab invented and is developing sheath-flow surface enhanced Raman scattering, which uses the unique pattern of scattered light associated with the structure of molecules, to improve molecular identification. We combine Raman detection with capillary electrophoresis, liquid chromatography and other techniques. This methodology is orthogonal to existing technologies and should extend coverage of number of detectable metabolites. Proteins on the surface and embedded with cellular membranes are key to communicating environmental signals to the machinery within cells, and are thus often drug targets. The ability to study the interaction of small molecules with receptors is a significant scientific challenge. By combining nanomaterials and state of the art spectroscopy and microscopy techniques, such as atomic force microscopy and tip-enhanced Raman scattering (TERS), we are able to monitor chemical signals associated with molecules interacting with specific proteins in intact cells. Understanding how molecules interact with signaling proteins offers promise to improve drug targeting as well as further investigate the role of membrane proteins in disease. Underlying all the problems we investigate is the basic science relevant to the signal enhancements incorporated into our measurements. We are interested in understanding how nanomaterials interact with light, particularly with respect to how these properties alter the response from nearby molecules. This basic science serves as the basis for the development of future measurement techniques and other applications, such as photo-catalysts for CO2 reduction. Nguyen, A. H.; Deutsch, J. M.; Xiao, L.; Schultz, Z. D., Online Liquid Chromatography - Sheath-Flow Surface Enhanced Raman Detection of Phosphorylated Carbohydrates. Analytical Chemistry, 2018, 90(18), 11602-11609, DOI: 10.1021/acs.analchem.8b02907. Nelson, D.A. and Schultz, Z.D. *, “Influence of Optically Rectified Electric Fields on the Plasmonic Photocatalysis of 4-Nitrothiophenol and 4-Aminothiophenol to 4,4-Dimercaptoazobenzene”, Journal of Physical Chemistry C, 2018, 122(15), 8581-8588, DOI: 10.1021/acs.jpcc.8b00662. Xiao, L., Bailey, K.A., Wang, H., and Schultz, Z.D. *, “Probing Membrane Receptor - Ligand Specificity with Tip Enhanced Raman Scattering”, Analytical Chemistry, 2017, 89(17), 9091-9099, DOI: 10.1021/acs.analchem.7b01796. Kim, J, Zeng, Z., Xiao, L., and Schultz, Z.D. *, “Elucidating Protein- Ligand Recognition with Combined Surface Plasmon Resonance and Surface Enhanced Raman Spectroscopy”, Analytical Chemistry, 2017, 89(24), 13074-13081, DOI: 10.1021/acs.analchem.7b04246.